The Grand Ducal Family was out and about today in quite a force to attend the Grand Duchy's first forum on learning disorders, which, among other this, focused on ways to integrate students facing learning disorders into the mainstream educational system. The topic is close to the hearts of the family as Prince Louis was diagnosed with dyslexia at the age of ten. The third son of the Grand Duke and Grand Duchess spoke about his experiences during the forum. 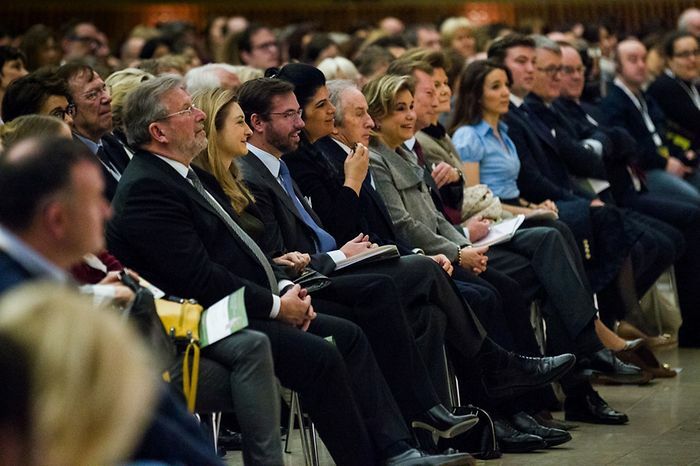 He was supported for the event by Grand Duke Henri and Grand Duchess Maria Teresa, who also was the patron of the forum and gave the opening remarks, Hereditary Grand Duke Guillaume and Hereditary Grand Duchess Stéphanie, Princess Tessy as well as Prince Sébastien. Also present for the event was Princess Margaretha. The sister of the Grand Duke has been the patron of Dyslexia International for many years. The forum was also attended, among others, by Princess Sumaya bint El Hassan of Jordan, daughter of the former crown prince, and Formula 1 world champion Sir Jackie Stewart. More pictures and information at Wort and Tageblatt.